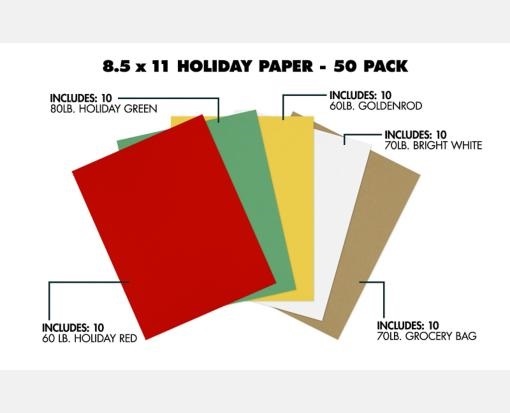 8 1/2 x 11 Paper in assorted holiday colors contain Bright White (10 qty), Holiday Red (10 qty), Holiday Green (10 qty), Goldenrod (10 qty) and Grocery Bag (10 qty) colored paper. Perfect for printing, copying, crafting, artistic applications and holiday announcements. Ideal for scoring and folding or cutting down to custom sizes. Durable and multipurpose this paper is made with 60lb. and 70lb. paper stock.